Dimensions 92.5 in. H.x 13 in. W.x 13 in. D.
I purchased two of these for my closet. They are perfect. 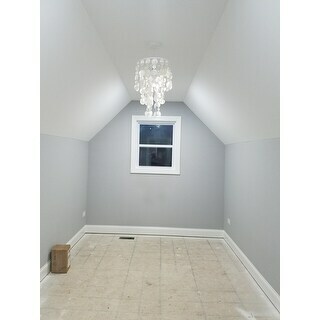 I have more light than I had before and they really made my closet more feminine. I received them in separate boxes and one box was damaged and the fixture had a broken piece. Overstock replaced the fixture right away. Couldn't be happier. 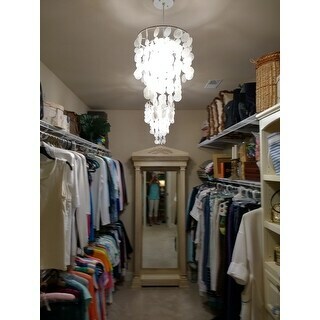 I purchased this small chandelier for my master bedroom closet and I love it! It's the perfect size and gives a touch of elegance.I was so in love when I walked into my closet. We love this light. It was bigger than I thought but fits perfectly in our halfway. Installation was a breeze except for taking off all the little bags from the shells. Beyond what I expected for the price. This was an added detail in my massage room. Delicate, feminine style &amp; soft lighting. This was a great purchase. Perfect accent light for my outdoor covered daybed. Put it on a dimmer and looks great for drama light. Excellent condition when delivered and packaged. Nicely made and a great price for the purchase. I think I'll buy another for another location. Love and super easy to install. Really classed up my closet and made it feel more feminine and pretty. I am happy with this purchase and recommend. This pendant is for my daughters nursery. I have yet to unbox and install it as we haven started the project. I am hoping it works well, as I am concerned about the low watts. I will give an updated review! Great price, as it beat competitors! 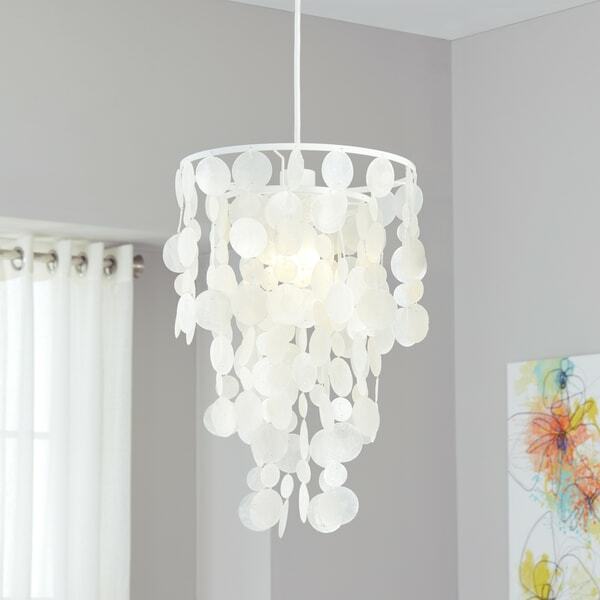 Nice, affordable alternative to a chandelier for a girl's bedroom. We used dimmable bulbs and would recommend installing with a medallion plate on the ceiling. Perfect for a simple/casual lighting element in a small space. It compliments a larger chandelier I have in my dining room. Perfect size for my midsized bedroom with about 10 ft ceilings- ish- that were too low for some other lamps I first tried. Really warmed up the room. It took my handyman no time to get it up there. Everything looked even better than it did in the picture! looks great and was easy to hang!! "Does it give off/emit enough light for a bedroom? I want to use it in a nursery, but it would be the primary light source. Thanks." I have a mother of pearl theme in my home. Glad I found this light. After reading reviews I ordered two to go in my closet. The fact that they are on sale didn't hurt either. I only hope they are not too white! It looks so light and airy, perfect for the dining room in my new Florida home! "Can a 60 watt bulb be used? I'm surprised it states only a 9 W bulb...is this an error?" This item has a 9 watt bulb and allows a max wattage of 13 watt. What kind of bulb? Can It be led 13 watt?